In her fascinating autobiography, Jo Brennan shares the joys and struggles she experienced in her personal spiritual journey while working as a missionary in Tanzania, Liberia and Sri Lanka. 'I loved your book. I kept it beside my bed because I kept wanting to read the next chapter, and the next. It's so honest. What you say reflects how we all so often feel.' - Ilda Wade. 'Jo has been prepared to bare her soul and allow others to know something of her own spiritual pilgrimage, her doubts, her fears, and her failures, as well as her deep desire to follow Jesus in obedience and sincere discipleship.' - Harry Goodhew, Archbishop of Sydney, 1993-2001. 'I would commend anyone's reading of this singular account of one's woman's 'pilgrim's progress'. An amazing story of dedication along with honest humanity, it speaks to the heart. Jo is both brave and timid, wise and foolish, but always seeking the Lord's way as he leads her across the globe in exciting service. A great read, intimate, inspirational and moving.' - Graham Wade, Founder and Chair Emeritus, Pilgrim International. 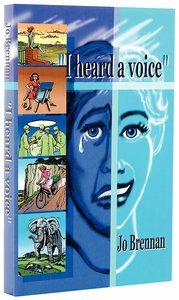 About "I Heard a Voice"
Jo Brennan studied art, then trained as a triple-certificate nurse. She went with the Church Missionary Society to Tanganyika which became Tanzania, then with SIM to Liberia. Finally she helped children living on the streets of Colombo, Sri Lanka. She now lives in Sydney, Australia, and worships at Trinity Chapel, Macquarie University at Marsfield in Sydney.